WARN’s VRX 45-S powersports winch offers all new levels of performance and best-in-class power. With a 4,500 lb capacity that is available with a synthetic rope, this winch is made for the hardest working UTVs. The durable, all-metal construction features black powder-coated finish for corrosion resistance and the waterproof sealing keeps the elements out. The new clutch design is based on the legendary WARN 4WD hub lock know-how. The three-stage planetary gear train is all-metal, smooth, and reliable, and the load-holding mechanical brake offers great control. The VRX 45-S includes 50′ x 1/4″ synthetic rope, hawse fairlead, and zinc-plated hook, as well as a dash-mounted control switch and corded remote control. 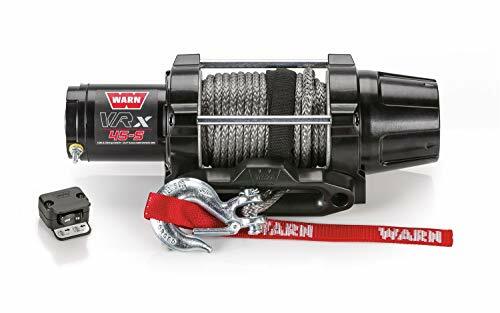 WARN offers a limited lifetime mechanical warranty and a 3 year electrical warranty on this winch.